Family owned, professionally run. How can we help? Mark always does a great job! 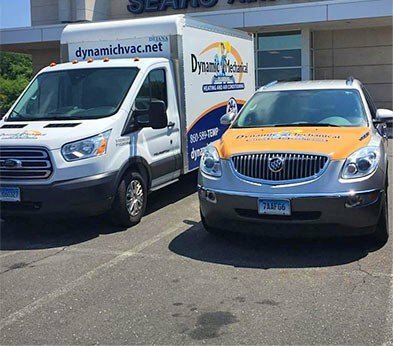 When you need to schedule any air conditioning, heating, plumbing or water heater installation, repair or maintenance services in the Bristol, CT area, just give Dynamic Mechanical Plumbing Heating & Air Conditioning a call. We also offer professional energy audits and maintenance plans to help you get the most out of your home comfort systems. Take advantage of a free in–home comfort consultation, and take comfort in knowing that we strive to achieve and consistently improve customer satisfaction. When you work with our team of skilled technicians, there will be no doubt in your mind as to the quality of the services you receive. When the cold weather arrives, make sure that you’re prepared with a heating system that is reliable and energy efficient. We install and service a wide variety of residential heaters. Nothing makes a hot summer more enjoyable than having the ideal air conditioner to keep your home cooled down. Rely on our expert technicians for cooling services of all kinds. What is in the air you’re breathing? If you have concerns about dust, chemicals, microbes, and other air pollutants in your house, reach out to us and we’ll find a solution. Home plumbing involves many parts, and it takes skilled plumbers to handle any installations, repairs, and replacements. Our licensed plumbers are ready 24 hours a day to help with any plumbing need. Protecting your business is also part of our business! Our team provides all the commercial heating and cooling services necessary to maintain the ideal indoor commercial environment. Winters in Bristol can be pretty harsh. Is your heating system up to the challenges that the cold winter months present? When you contact the Bristol, CT heating and air conditioning company you can trust for your heating installation, repair and maintenance service needs, you will get the services you need to keep your heater operating at peak efficiency and performance levels. 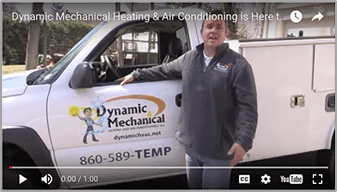 Contact Dynamic Mechanical Plumbing Heating & Air Conditioning today to discuss your heating options, including boilers, furnaces, heat pumps, radiant heating and hybrid heating systems. When summertime arrives, you need to know that your air conditioning system is able to provide you with the consistent, effective cooling performance you need to make it through the hottest time of the year comfortably. We have an extensive selection of air conditioning systems for homeowners in Bristol to choose from. Just because split central air conditioning systems are so common does not mean that they are right for you and your home. Learn about the benefits that ductless mini splits, high velocity systems, heat pumps and even geothermal technology have to offer. When you schedule your air conditioning services with the professionals on our team, you’ll be able to cool your home with complete confidence. Watch our owner, Nathan, explain more about us. You water heater is one of the most important appliances in your home. There is no way that you can expect to live with the comfort and convenience you need if your water heater does not operate efficiently and reliably. From taking showers to doing laundry and dishes, you rely on your water heater far too much to take any chances with its operation. Contact us today to learn more about the tank and tankless water heaters we carry in the Bristol, CT area. Don’t trust just anyone with your comfort and the condition of your heating, air conditioning, indoor air quality or water heater equipment. Schedule service with Dynamic Mechanical Plumbing Heating & Air Conditioning. Our skilled technicians have years of experience with heating and air conditioning installation, repair and maintenance in the Bristol area. Are Your Air Ducts Working for You, or Against You? Considering how important ductwork is to the operation of these systems, it's surprising as how often overlooked air ducts are. © 2013–2019 Dynamic Mechanical Plumbing Heating & Air Conditioning. All rights reserved.